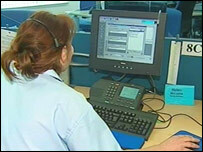 The NHS helpline dealt with almost 90,000 calls over the festive period, figures show. Staff at NHS 24 worked round the clock while doctors surgeries were closed, dealing with almost twice their normal number of inquiries. Queries ranged from medication to more serious symptoms. However, there were also calls about hamster bites and from people who expected the emergency service to help when they ran out of condoms. The service took a total of 89,700 calls from members of the public between 25 December and 4 January. It worked alongside local out-of-hours providers - the Scottish Ambulance Service and A&E departments, all of which were extremely busy during the festive break. The vast majority of calls were answered within five minutes and on Boxing Day 83% of calls were answered within 30 seconds. The busiest day over the entire period was 3 January when almost 14,000 calls were answered. The average time it took for their call handlers to answer calls then was about one-and-a-half minutes, with the maximum time being about ten minutes. During excessively busy times serious complaints were dealt with right away and non-urgent calls received a call back with medical advice the same day. Bill Templeton, acting chief executive, said: "NHS 24 coped extremely well over the holiday period, which took in two weekends - traditionally a busy time for the health service. "Our staff rose to the challenge in a highly professional manner and coped very well with a huge diversity of calls, some of which were extremely serious. "We were able to give out advice and reassurance where appropriate, or to filter the right people to the correct emergency service, as required. "This helps people to get assistance appropriate to their needs, and aims to reduce the strain on other aspects of the NHS." Some calls to the service related to non-urgent conditions such as dandruff, acne, split nails and head lice. NHS 24 staff stress that anyone genuinely concerned about a symptom should always phone for advice but should expect to be called back when the service is quieter. Callers were also advised to stay on the line if their call was not answered right away as enquiries are answered in the order they are received. Some callers hung up and re-dialed but that automatically put them to the end of the queue each time.